Apples to Apples is a game of hilarious comparisons. 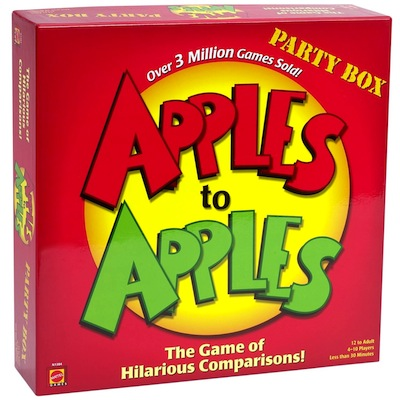 This wild, award-winning card and party game provides instant fun - it's as easy as comparing apples to apples. Deal the cards, then select the card from your hand that you think is best described by a card played by the judge. If the judge picks your card, you win that round. Each round is filled with surprising and outrageous comparisons from a wide range of people, places, things and events - and everyone gets a chance to be the judge. The Party Box comes complete with over 1,000 cards.